The National Assembly’s Environment and Labor Committee’s proposed visit to China to address the issue of fine dust has fallen through due to the Chinese government’s refusal, the committee said Wednesday. 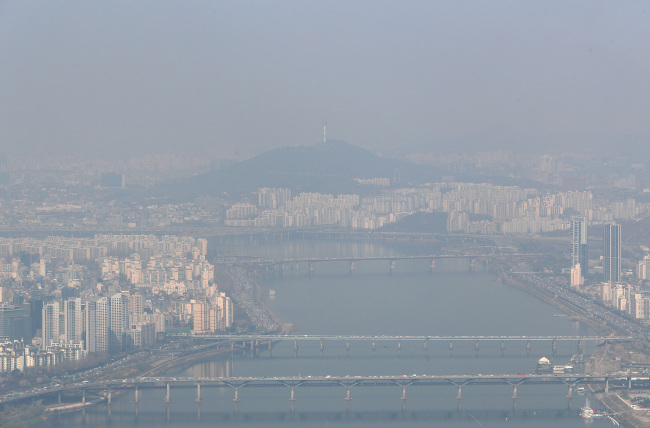 The neighboring country’s refusal to meet with lawmakers of the committee to discuss reducing fine dust -- high levels of which hit South Korea last month -- has sparked controversy that China is attempting to shirk responsibility. Earlier this month, China’s National People’s Congress declined a meeting requested by the committee’s eight lawmakers, including committee chief Rep. Kim Hak-yong of the main opposition Liberty Korea Party. “China delivered its refusal (for a meeting) verbally through the Korean Embassy in China, saying that the National People’s Congress did not make an official invitation,’’ a member of the Environment and Labor Committee said. Korea and China have locked horns over the cause and source of Korea’s record high levels of fine dust, which pose serious health risks. Emergency fine dust reduction measures had been issued on seven consecutive days last month, and the number of patients suffering from respiratory problems soared 29 percent on-year to 7,618 patients in March, according to data from the National Fire Agency. National Assembly Speaker Moon Hee-sang is also pushing to schedule a meeting with Chinese officials to discuss the issue during his trip to China next month. Moon is expected to be joined by Environment and Labor Committee head Rep. Kim Hak-yong and assistant administrator Rep. Han Jeong-ae of the ruling Democratic Party, among others. Seeking to draw up measures to curb fine dust, Korea has set up a national fine dust agency and tapped former UN Secretary-General Ban Ki-moon to lead the agency. “I met with Chinese President Xi Jinping earlier this month in China and delivered severe concerns about fine dust. I was promised close collaboration,” Ban said at a seminar earlier this week. Chinese officials’ refusal to meet with Korean lawmakers came after the promise Ban had received.